Electronic data interchange (EDI) technology goes back as far as the 1960s, yet it’s still a common tool used by many businesses today. What has prolonged its life is its security, reliability and ubiquitous presence. And while many have spoken of API’s ability to replace EDI software, it doesn’t look like it’s going anywhere soon. The EDI market is projected to be worth nearly six billion dollars by the year 2025 with 85 percent of the industry utilizing the technology today. As a result, it’s still a smart move to invest in these tools. To help you out on your software selection journey, we’ve compiled a checklist of popular EDI requirements. Use it to compare vendors to get a system that perfectly fits your needs. Get our EDI Software Comparison Matrix. EDI software features are very important to consider when shopping for a new system. However, you need to consider other factors as well. What kind of support system does my EDI vendor offer? This is a good question to ask during any software selection but it’s especially important when EDI is concerned. EDI systems do not come as out-of-the-box solutions, requiring large amounts of configuration to utilize properly. Make sure your vendor offers thorough support or that you have a strong IT staff in-house that can handle the extra work. Additionally, you might want to inquire about 24/7 support teams if you do business internationally. Are My Business Partners Using EDI? If more and more of your business partners are adopting EDI, it’s probably high time to adopt it yourself. Your business partners are already seeing the benefits of reduced paperwork and the time it takes to process it. You don’t want to be the one holding them back from fully streamlining their operations. Conversely, if your business partners aren’t using EDI, you need to think about the effects of employing it in your practices. What Payment Method is Best for My Company? Different EDI providers charge using different payment structures and one may be better for your business than another. Your vendor may charge based on the number of characters in a document, charged monthly, annually and in several other ways. Whichever way a potential vendor charges, make sure you’re getting the best price per transaction for your company. Your EDI software should support all types of translation systems to convert all standard EDI formats into other formats. It should also promote integration with ERP and accounting solutions. There are standalone systems, but they require a small amount of manual work. Fully-integrated systems are also fully-automated. This means there’s even less chance for human error to make its way into your processes. You also should look for a solution that can securely transfer files over both public and private networks. EDI software uses encrypted file transfer protocols like VAN, AS2, FTP/sFTP and HTTPS. Additionally, EDI software may support several different formats such as ASC X12, EDIFACT, Tradacoms, XML and others. ASC X12 is the most popular in North America and EDIFACT is the most popular outside of the continent. Tradacoms is getting replaced more and more by EDIFACT but is still popular enough that you may want to consider a system that can handle the format as well. In order to properly send and receive data using EDI software, you need to map your EDI messages. The EDI map converts files from your ERP into an EDI file, configuring all the details to match correctly. Then your trading partners’ software takes the EDI file and reverses the configuration process so that it is once again readable to their ERP system. EDI mapping software facilitates this process, eliminating the need for expensive in-house operations. Drag and drop interfaces allow users to map out hierarchical structures required for EDI. However, EDI software isn’t an out-of-the-box solution. As such, your company likely needs the help of consultants and experts to correctly perform the mapping process. Make sure your EDI vendor provides this support in a reliable manner. EDI testing is necessary in order to meet industry compliance requirements. For instance, healthcare organizations must test their EDI transactions to see if they are HIPAA compliant. Many systems offer a testing environment for system administrators to validate all features and functionalities before the software is deployed. It ensures that services delivered to the end-user are as per the requirements of the trading partner while maintaining data security. Other vendors offer to do the testing themselves. These tools monitor all transactions that occur between you and your trading partners. It helps users identify trends across transactions through automated analysis. These trends are displayed through dashboards and other reports. Moreover, transaction lifecycle management finds errors such as duplicate entries and eliminates them. 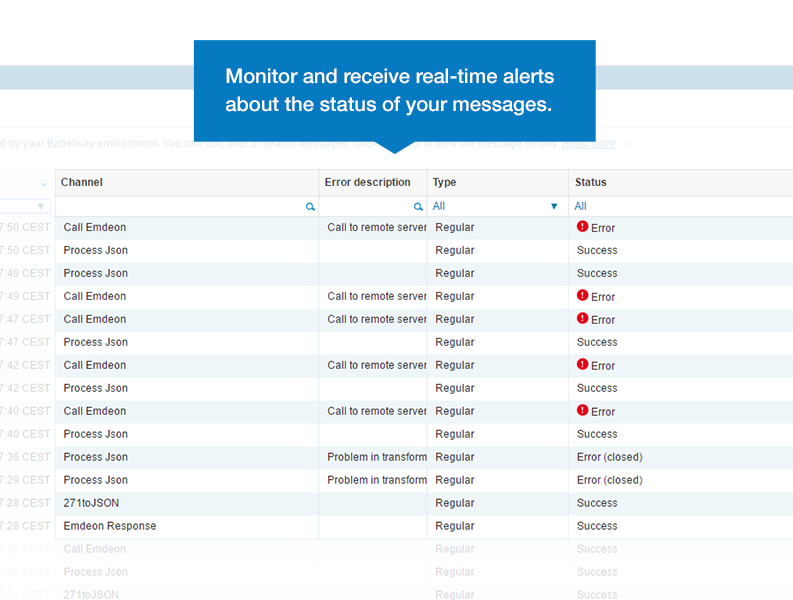 Some systems provide alerts when a transaction has been successfully completed or if it has failed. These alerts can be sent through either email or text message. The close monitoring this feature provides, in addition to the alerts, ensures that users will always be up-to-date on the status of transactions. This allows users to identify and fix errors before they become major issues for either you or your trading partners. As mentioned earlier, there are some manual processes involved when a company chooses a standalone EDI software. This provides the opportunity for human error to present itself and wreak havoc. All it takes is for one decimal to be in the wrong place for some massive damage to be done. That’s why it’s important your system can be fully integrated with your ERP or accounting systems. Standalone systems are good for businesses with very few EDI transactions or those that find themselves only busy during certain parts of the year. Typically, these companies have the resources to focus on preventing human error. However, if your business is expecting growth, it might be a good idea to integrate sooner than later. This functionality mostly depends on the specific systems each EDI software is able to fully integrate with. You need to make sure that the system you end up choosing for your company can integrate with all your software, mobile devices and that it can work with all deployment methods your other applications utilize. EDI integration is also supported by an API to facilitate custom integrations. Additionally, some systems provide Lightweight Directory Access Protocol (LDAP) to access an Active Directory (AD) database. A good EDI software should handle even your most complex EDI documents. Document management allows normal business documents like purchase orders or invoices to be converted into an EDI-compliant version automatically. You may also shop for a system that can handle exceptions while meeting compliance. Exceptions can back up orders, and without an automated method of solving them in place, your company is likely to spend more on IT staff to solve the issues. Additionally, EDI software can support cross-document tracking, EDI orchestration and master data management (MDM). MDM allows your team to access one single source of truth. This makes it easy to avoid errors caused by varied sets of information. Processing orders via paper and mail can cost up to $70 per order. But with EDI, that cost goes down to less than one dollar. In order to see such an excellent ROI, however, you need to make sure your system can handle all the order management features you need. Order management solutions automate key EDI processes and exceptions management. For instance, many vendors provide EDI workflow management along with automated EDI transaction tracking and notifications. Both these tools reduce time and costs while improving supply chain visibility. Additionally, many order management tools provide secure storage and translation of your purchase orders, invoices and packing lists. They also support purchase order acknowledgments for confirmation of prices, quantities and delivery time. Like with any business software, capitalizing on the data your system already accumulates is a no-brainer. EDI platforms can be integrated with third-party applications for reporting and business intelligence. It allows users to view data on demand using ‘Schema-on-Read’ technology and to track EDI activities through custom dashboards. You may also choose a solution strong on SLA, monitoring, uptime and availability. Many systems offer customized SLAs to meet customer requirements as well. Some solutions even promise service uptime of over 99.9 percent. The way you deploy can change how you use your software and how you set it up. On-premise solutions provide more control but can be costly upfront. This type of deployment is often preferred by companies who are concerned about security and those who are in rural areas with poor internet connection. However, hosted solutions reduce setup fees and the need for in-house personnel. They also make updating the system much easier. Some systems support mobile access as well. This means users can access the system from platforms such as iOS, Android and more. The method you choose will depend on your company’s needs. Databases provide your company with a single source of information. Whichever EDI solution you choose, make sure it has access to the database you use in everyday business. Some systems have access to all three databases listed below, but others may only support one or two. With all this in mind, you’re ready to start evaluating systems. In addition to assessing solutions against your business requirements, you need to also compare systems against each other. But collecting all the information you need from each vendor you’re considering is not exactly easy. Not to mention trying to organize it all in a cohesive manner so that you and other stakeholders can determine which vendor is best. However, we have a tool that can eliminate the headache of comparing vendors. We recommend using our EDI comparison matrix, which allows you to compare leading vendors side by side. There’s no more need to scour the internet worrying that you’ve missed a piece of vital information. Our analyst team has scored and ranked each vendor by how well they meet all of the business requirements listed above. What did you think of our list of EDI requirements? Are there any we missed? Let us know by leaving a comment at the bottom of the page.